From the cucumber and marrow family, the Luffa is a rather curious example which originates from America. After drying, the fibrous internal structure of the Luffa magically transforms itself into a' sponge', 30cm long. Home-grown sponges, whatever next?! 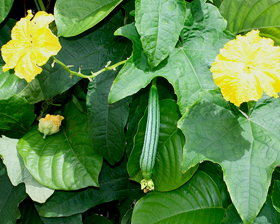 Treated as a half hardy annual in all areas, Luffa can be grown on any ordinary soil in a position of full sun. Climber. Sow February to May. Soak seed in warm water for 2 hours before sowing. Germinate singly in pots, at 20-30C on the surface of a good free draining, damp seed compost. Apply a sprinkling of compost or vermiculite, 6mm thick. Place in a propagator or seal container inside a polythene bag until after germination which usually takes 7-21 days.